Home > What is best practice formula feeding? A guide to all parents. While breastfeeding is the preferred approach to infant feeding, 80 per cent of parents in Australia introduce formula within the first year of life. Dr Laws says for healthy full-term babies, there is little evidence to say that one formula is better than another with the exception of protein levels. “The Australian Infant Feeding Guidelines actually recommend choosing a formula with a lower amount of protein, as a large trial conducted in Europe found that a higher protein content of infant formula is associated with higher weight in the first two years of life,” she said. Infant formulas available in Australia have a protein content within the range of 1.3-2.0 grams per 100 ml, so choosing a formula at the lower end of this range is preferable and protein levels will be similar to that found in breastmilk (1-1.1 g protein per 100 ml). Infant formula (known as step 1, stage 1 or from birth) also typically have lower amounts of protein than follow-on (step 2 or stage 2) formulas. So, stick with infant formula, it is the only type of formula babies need until they are 12 months old. At 12 months (not before) babies can have regular full cream cow's milk. Most healthy toddlers do not need formula or toddler milk. It’s also important not to add anything else to the bottle. Dr Laws says that all babies, whether being breast or formula fed should be fed ‘on demand’, in response to the baby showing signs of hunger (e.g being awake and alert, rooting or sucking, mouth opening), rather than by the clock. “Feeding in this way, that responds to babies hunger signs as well as signs of fullness (e.g. turning away, closing mouth) is termed responsive feeding. “For babies fed with a bottle it is important that parents attend to these ‘cues’ to avoid pressuring their baby to finish the bottle. This may override a baby’s innate ability to self-regulate their intake and could even impact later eating behaviour,” she said. Dr Laws said that attending to these cues means you need to be holding your baby to feed them. “Parents can be tempted to let older babies feed themselves or put them in their cot with a bottle to go to sleep. This is not recommended as it can be a choking hazard, lead to tooth decay, unhealthy weight gain and disturbed sleep. “Babies will vary in how often they want to feed in response to hunger, thirst, hot weather and parents need to be supported to understand that this is completely normal. “The information on the tin about how much and how often to feed is a rough guide only and parents shouldn’t worry if their baby does not drink as much or as often as suggested, as long as they are having plenty of wet nappies and are growing and developing normally,” she said. Dr Laws said that if parents have any concerns, they should always talk to their GP or maternal and child health nurse. The Australian infant feeding guidelines also have a helpful table of formula requirements by age and weight. 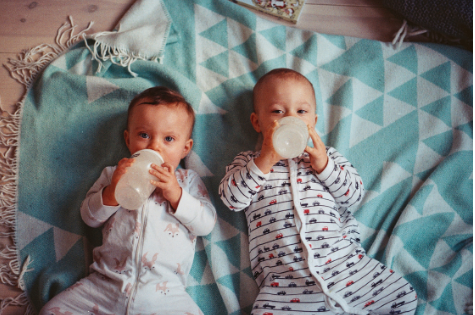 Prolonged use of bottles into the toddler years is associated with a higher risk of later overweight and obesity, along with a host of other problems including tooth decay, iron deficiency and speech problems. Dr Laws says it is recommended that parents introduce a sippy or training cup at 6 months and aim to phase out bottles by 12 months of age. If you would like to learn more about feeding your baby across the first year of life, join Deakin University’s free Infant Nutrition online course: https://www.futurelearn.com/courses/infant-nutrition running until January 14.